The HPOL spectropolarimeter is a modified Boller and Chivens small telescope spectrograph. The system provides simultaneous spectrophotometry and spectropolarimetry over the range of 3200A to 10500A (prior to 1995, the spectral range was 3200A to 7750A), with a spectral resolution of 10A (25A prior to 1995). The halfwave plate is a super-achromatic half-wave retarder. The wave plate is rotated by a stepper motor and rack and pinion drive, with stops every 11.25 degrees. A Wollaston prism produces two orthogonally polarized beams (ordinary and extraordinary) separated perpendicular to the dispersion. The ultraviolet achromatic camera is specifically designed for this instrument. The camera is all-refractive, which eliminates vignetting and thus enhances the polarimetric stability. The image is focused on a 400 X 1200 pixel CCD. Through 2004, the instrument was primarily installed as a dedicated intrument to the 36" telescope at the University of Wisconsin-Madison Pine Bluff Observatory (PBO). 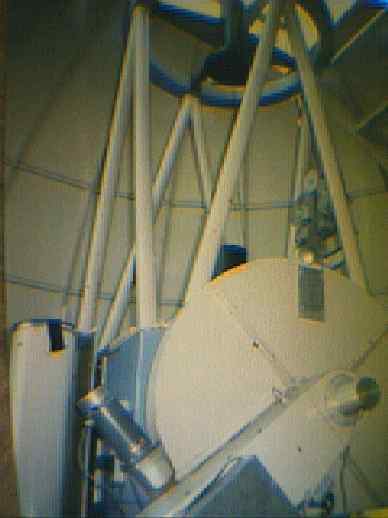 HPOL was also mounted on the 3.5 m WIYN telescope at Kitt Peak National Observatory for limited observational runs once a year or so. HPOL stopped taking data at PBO in October 2004 due to hardware problems. HPOL no longer resides on the 36" telescope at Pine Bluff Observatory. 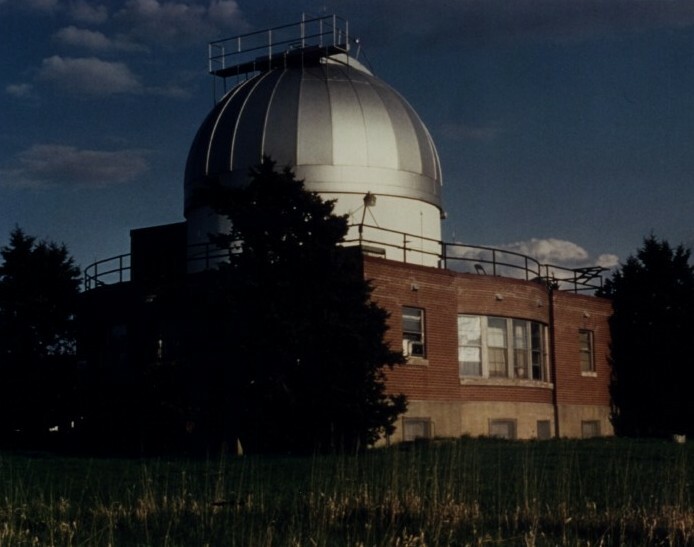 It was relocated to Ritter Observatory, a 1-meter telescope at the University of Toledo run by the Ritter Astrophysical Research Center and refurbished. This project is led by Dr. Karen Bjorkman (University of Toledo), Dr. Jennifer Hoffman (University of Denver), Dr. James Davidson (University of Virginia) and Dr. Jon Bjorkman (University of Toledo). 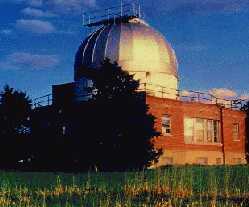 HPOL has been in operation at the University of Toledo's Ritter Observatory, with 'first' light on March 11th, 2012. Final instrumental polarization calibrations have been created for observations from March 11, 2012 to May 2, 2013. Results to date from Ritter Observatory are comparable with results from PBO. More details can be found in The HPOL Spectropolarimeter at Ritter Observatory. Fits files and ASCII files for all of the HPOL medium mode data taken at PBO (February 1989 through October 10, 2004) can be obtained from the Mikulski Archive for Space Telescopes (MAST) . The HPOL target database was last updated Jun 20, 2016. 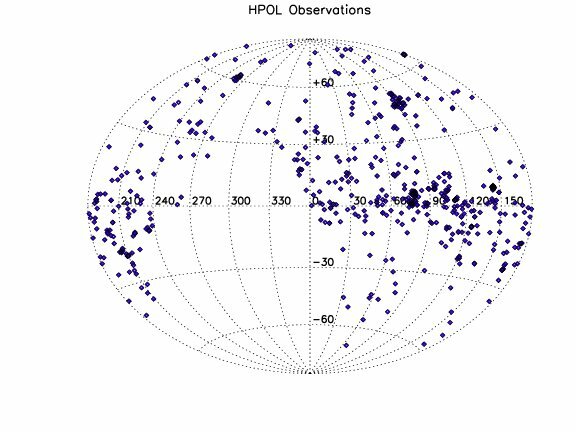 This plot shows all HPOL observations in galactic longitude and latitude.